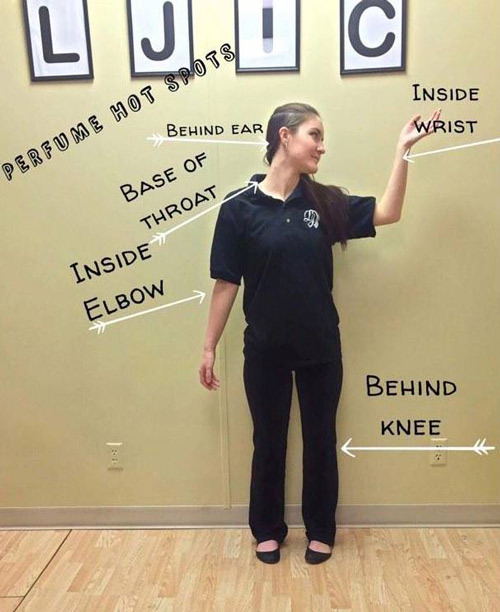 La’ James International College East Moline shares information on Perfume Hot Spots in this week’s #LjicTuesTorial! The wrists serve as a pulse point and an area of enhanced heat to further amplify the scent. For those who are expressive talkers, give the back of your hands a gentle dab with the fragrance to get your perfume noticed in transit. The veins are closest to the skin, thus generating more heat and amplifying your scent. Dabbing your fragrance on these points will give you more immediate results, as opposed to parts of the lower body, which will rise up through the day. Maximize the power of your perfume by giving your collar bone and décolletage (neck, shoulders and back) a spritz. Perfume is more likely to settle in the dips of the bone structure, and the added bonus of wearing strappy tops and plunging necklines means there’s extra surface area to exude fragrance from. Another pulse point is the inside of the elbows, which gives off the enhanced fragrance & serves to slightly obscure the smell in the bends of the arms. This is perfect for longer-lasting diffusion. TIP: Maximize the power of the perfume by ensuring skin is moisturized. The more hydrated your skin is, the longer the fragrance will last. Behind the knee is another obscure pulse point. It is a more tucked away alternative to your wrists. TIP: To maximize the diffusion of your fragrance, be sure to moisturize your arms (or any other part of your body) before you spritz on your scent.